I did this walk on Sunday 1st August 2010, with almost three months having elapsed since I had walked the previous stage. 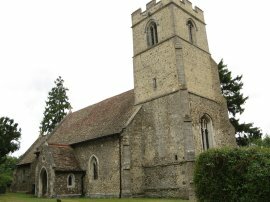 I parked by the church in Great Eversden from where it was just over a two mile walk back towards Old Wimpole to the point I had finished my last walk along the Harcamlow Way. I regretted not having walked a little bit further last time around as due to the absence of suitable footpaths there was a section of about mile I had to walk along the Harcamlow Way to get to the start from which point I then had to turn round and walk back again. 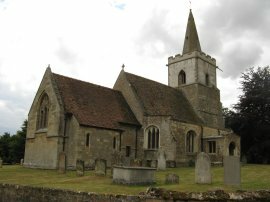 From Great Eversden I headed along a byway that runs besides the church. The byway then heads to the right to reach a road where I turned to the left. 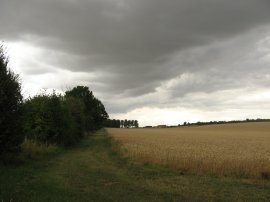 The tarmac soon ends and the path becomes a farm track that heads gently uphill between fields, photo 1. Reaching the top of the hill I joined up with the route of the Harcamlow Way which I then had to follow downhill to reach the small bridge where I finished the last stage, photo 2. I then turned around and began retracing my steps back up towards the top of the hill again, this time following the route in the right direction. 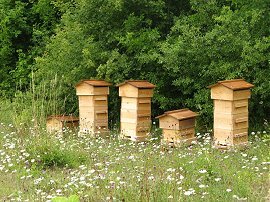 As I was heading up the farm track I spotted a few beehives at the edge of the field, photo 3; they were quite new looking and I wondered if they had any bees in them, I didn't particularly notice any flying about. At the top of the hill, by two round concrete reservoirs, the Harcamlow Way turns to the left along a track marked as Mare Way on my map. 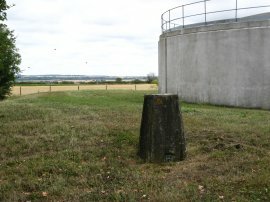 In the grounds was a trig point, photo 4, which was a surprise as it was not marked on my map, although it is shown on multimap. 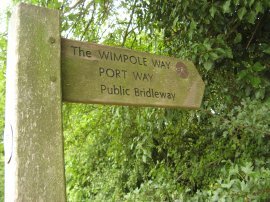 The route follows Mare Way, photo 5, besides fields and through a small patch of woodland to briefly join a road where the path links up with the route of the Wimpole Way which then shares the remainder of its route with the Harcamlow Way all the way into Cambridge. Passing a farm the route joins another track on the right, marked on the map as Crane's Lane, that runs down between fields towards the village of Kingston. 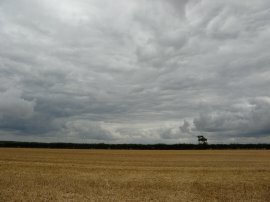 I could hear a buzzard calling overhead although was unable to spot it against the grey clouds. Away to my right in the distance I could see a big white telescope, photo 7, which would come periodically into view throughout the duration of the days walk. Reaching the edge of Kingston the route joins a tarmac road which marks the start of a fairly lengthy section of road walking. 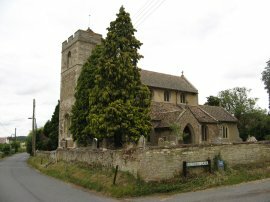 At the junction with Tinkers Lane the route turns to the left to head through the village, passing the Church of All Saints and St Andrew, photo 8. 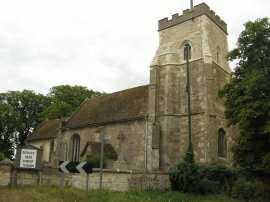 It was only when reading up later that I discovered what an interesting church this is with its old wall paintings. From the Church the route continues ahead along Church Lane, heading out of the village to the B1046. 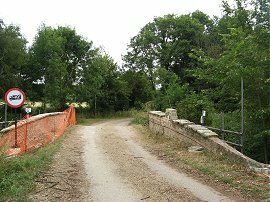 Here the route turns to the left for a short distance before heading up to the right along Main Street which heads towards the village of Caldecote, photo 9. The road heads uphill, passing the church of St Michael and All Angels, photo 10, and a few isolated buildings on the outskirts of the village before joining a footpath on the right that runs down the edge of Carra Farm. 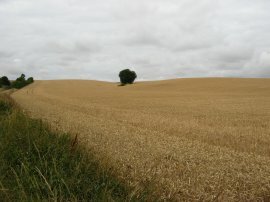 This continues ahead along a field edge before bending round to the left following a broad grassy track that runs alongside the edge of a patch of woodland. The weather remained grey and cloudy all day and at times there were some very interesting cloud formations in the sky, photo 11. Despite the rather thick cloud the weather remained dry all day and there was almost no breeze at all which made a marked change from a lot of my other walk along the Harcamlow Way. 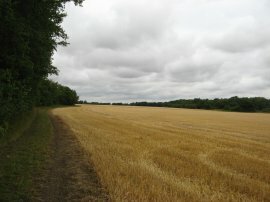 The path continues ahead for a short distance after the woodland ends before turning to the right and beginning a fairly straight course between fields along a set of paths that will ultimately lead to Cambridge, photo 12. Where the path turns to the right there is another footpath that continues straight ahead although, as a small sign indicates, it ends after a further 875 mtrs and does not lead to another path or road which led me to wonder how the path ended up like that. 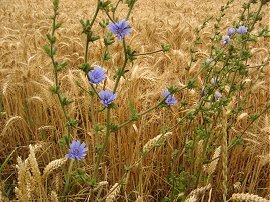 A number of fields I walked past had been cut but in many places the golden crops of Wheat and Barley, photo 13, where waiting to be harvested. 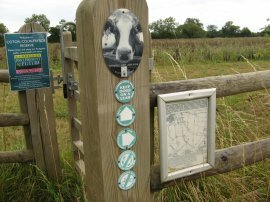 As mentioned earlier I was now also following the route of the Wimpole Way and occasionally I passed a way mark for the walk, photo 14, although there were by no means sufficient of these to allow the path to be followed without a map or guide. After a while the path reaches a road by a development of new houses on the Hardwick where it turns to the left for a few yards before once again joining another footpath that runs off to the right between fields. After a couple of fields the route turns to the left though a small patch of trees before once again turning to the right along a path that runs between fields to right Long Road. As I was walking along this stretch of path I finally got to see a view over Cambridge in the distance, photo 15, although it can't really be seen in the gloomy photo. Reaching the road, the route once again turns left for a short distance along the road before heading to the right along a track that heads through a small area of woodland. Entering the woodland there was a handy concrete block, which despite not being in the most attractive location made an ideal seat for a lunch break. Suitably refreshed I headed through the trees and onto another farm track running between fields. The land to the right of the track is part of a military firing range and there were signs warning not to touch any military debris as it may explode or kill you. 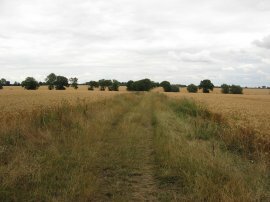 Eventually this track becomes a tarmac road that leads into the village of Coton, where by St. Peter's church, photo 16, I finished my walk along this stage of the Harcamlow Way having walked a further 9.5 miles along the path. My intended route back to Great Eversden involved using a footpath that ran over the firing range however when I headed past the entrance to the range in the morning I noticed a red flag flying and had been able to see another as I was heading towards Coton. As I left Coton along a footpath that runs besides the church I could also hear the sound of occasional shooting which made me think I may have to plan an alternative route back, something I had consider when planning the walk but would have rather avoided as it would add a fair bit of extra distance to the walk. 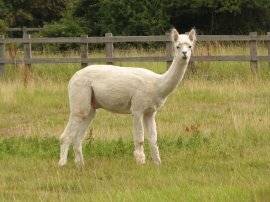 In the field behind the church was a llama, photo 17, or at least I think it is a llama rather than an Alpaca judging by its size. The path then headed through a patch of scrubby overgrown ground and along the edge of a driveway to reach Granchester Road. On the map it seemed as if I would have a fairly long stretch of road walking to reach the path that led to the firing range which I had been rather unsure about doing as I had no knowledge of the road and whether there were suitable verges to avoid the traffic. However luck was with me and a short distance down the road I came across a sign for the Coton Countryside Reserve and its associated network of paths, one of which ran alongside the road, photo 18. Reaching a car park I crossed over the road to join another footpath on the other side of the road which led to the path to the firing range. 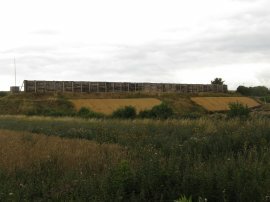 The reserve, covering about 120ha is managed by Cambridge Past Present and Future and although still farmed, the land is being proactively managed to benefit both wildlife and local residents. It also made a for a very welcome escape from the road. For the second time today my luck was to be in as despite there still being a red flag flying when I took photo 19, looking along the footpath that led to the firing range, by the time I reached the range which is located by the tall trees on the horizon, the red flag had been lowered, indicating it was safe to cross. There was nobody in the small guard hut at the entrance to the range, although there was some interesting graffiti, and as I went through the metal gate onto the range I could see that everybody was in the process of packing up. It was just before 2:00pm and I wondered if that was the designated finish time for Sundays. Anyway, it was a real bonus not having to detour round site and I was pleased that I had not arrived 5 or so minutes earlier. Once over the firing range, photo 20, I joined another field edge path that runs down to join the B1046 Barton Road, passing through another small nature reserve on the way. 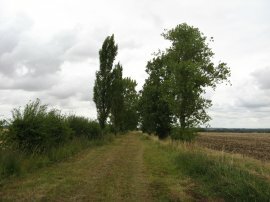 This section of the road had a footpath besides it so it was an easy walk along the road to the village of Comberton. Reaching a mini roundabout the Harcamlow Way takes a road on the left that soon becomes a hedge lined byway, once again heading between fields. 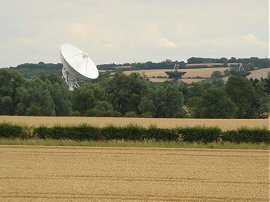 Ahead of me was the telescope that I had been seeing all day, along with a couple of other smaller telescopes, photo 21, which form part of the Mullard Radio Astronomy Observatory at Lord's Bridge. 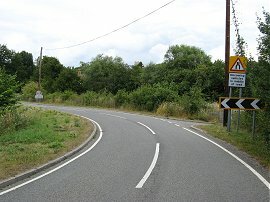 The byway bends round to the right to join Comberton Road where the route heads to the left, going gently downhill to cross over a small stream, Bourn Brook, at Fox's Bridge. 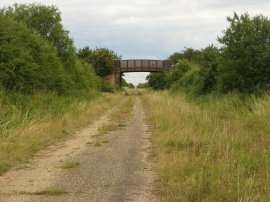 A short distance further the route joins a footpath on the right that runs along a field edge before crossing over what was the route of the now-abandoned Cambridge-Bedford railway line. 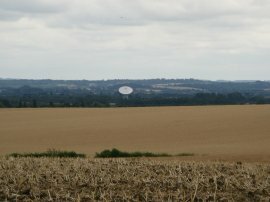 A portion of the track bed of the old line, photo 22, running nearly East-West for several miles, was used to form the main part of the "5km" radio-telescope and the Cambridge Low Frequency Synthesis Telescope. 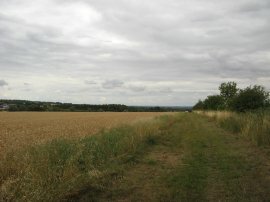 The path then continues ahead between fields to reach the village of Little Eversden. After passing a number of houses I joined a footpath on the right that headed towards Bucks Lane. 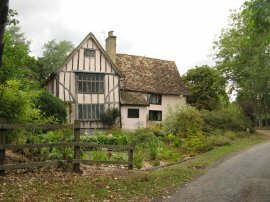 The path continues over the lane, passing the attractive cottage in photo 23. The path then headed through a small area of trees and across a field to reach Church Street in Great Eversden, just a few yards away from where I was parked besides St Marys Church, photo 24. Reaching the car I had walked a total distance of 17.7 miles. I was still feeling quite fit at the end of the walk and was so glad to have had the opportunity to be back walking the Harcamlow Way, hopefully it will not be three months till I do the next section which is going to take me through Cambridge. I have uploaded the route of the walk which can be accessed here Harcamlow Way 8 Route.